For a large selection of tattoo styles, a clean studio, and experienced artists, visit Infamous Ink Studio! You'll find our rates affordable, our tattoos detailed, and our tattoo artists friendly. We'll make your dream tattoo a reality! 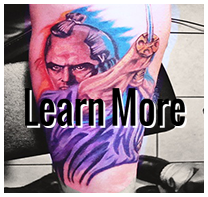 We create customized tattoos every day and will bring your body art design idea to life! You may choose a cultural tattoo to show pride in your heritage. You can memorialize a loved one by getting a portrait of that person tattooed on your body. If you want to immortalize a favorite quote or motto you live by, a tattoo will work beautifully. From the whimsical to the intimidating, tattoos are a powerful way to express yourself. 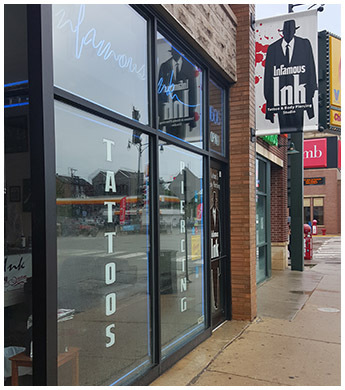 Infamous Ink Studio is a tattoo shop and body piercing studio that serves anyone 18 years of age or older. Located in Chicago, Illinois, we specialize in custom designs and portraits, but we're not limited. We offer basic body piercing, but no extreme scarification. With over 40 years of combined experience, we stand by the quality of our work and the cleanliness of our studio. We make sure all our equipment is safe and sterile, and our prices are affordable. If you'd like to get tattooed with a group of friends, reserve your tattoo party at Infamous Ink Studio! Groups of five or more receive a discount! A reservation and deposit will be required. Sorry, no food or alcoholic beverages are allowed! Monday - Thursday: 12:00 p.m. to 12:00 a.m.
Friday & Saturday: 12:00 p.m. to 2:00 a.m.